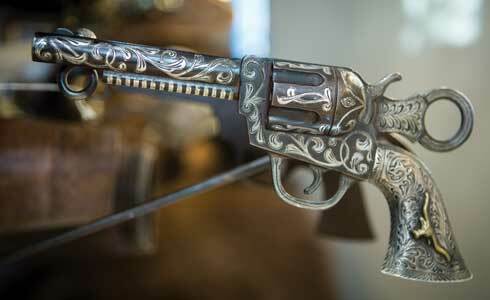 leans on a 1908 Winchester repeating rifle that he lists at $1,500. TEARFULLY, THE WOMAN WITH THE busted marriage told Randy Rodriguez she couldn’t afford to pay him $300 for cutting, splitting, and stacking her fire- wood. He eyed a black-on-black Santa Clara Pueblo pot that sat beautifully in her living room. Maybe he could sell it, he offered. “Could you get $1,500?” she asked. Six thousand five hundred dollars later, the woodcutter had found a new career and a consuming passion. The hunt for gold in what’s old drives dealers, decorators, collectors, and DIY repurposers all across New Mexico—a state that’s been inhabited for millennia. What comes with history and people? Stuff. Lots of stuff. In antiques stores and flea markets all around the state, our predecessors’ dusty discards just might include a Hollywood Regency dresser. Or a WPA trastero. Or an Alvarado Hotel room key (for an eye-popping $500). Spanish Colonial artifacts and vintage Navajo rugs may have grown scarce and expensive. The internet may have taken a bite out of what ends up in shops. TV programs like Antiques Roadshow and American Pickers have surely nudged prices higher. But cool old stuff still awaits, from the charmingly shabby to the lusciously luxe. Are you willing to paw through bins of record albums, upcycle bookcases into bar carts, or indulge the ascendant trend of “mantiques” (with laboratory beakers, factory fixtures, and cabin essentials)? Draw inspiration and take some tips from these four pros. based on Gene Autry’s movie sidearm. Randy Rodriguez shows up later than his shop’s posted opening hour, courtesy of a problem with a horse trailer. For once, he isn’t using it to haul his beloved mounts. Instead he needs it for an antiques-hunting road trip, intending to round up a bounty for his Rio Bravo Trading Company in Santa Fe’s Railyard District. When Rodriguez arrives, cowboy-booted and spouting a stream of down-home humor, a patient customer finally steps inside. 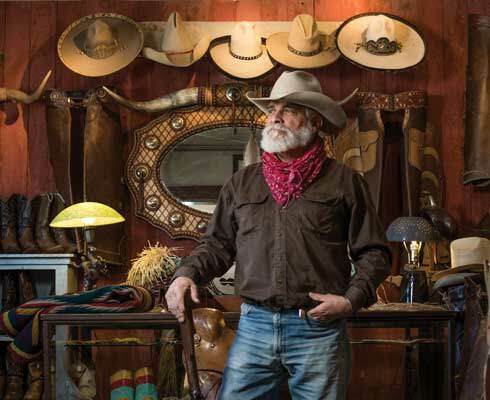 Surrounded by everything from cowboy kitsch to fine Native arts and jewelry, Pendleton blankets, a massive buffalo head, J.R. McChesney spurs, and a neon war bonnet, the man beelines toward the lived-in cowboy hats dangling from the ceiling. 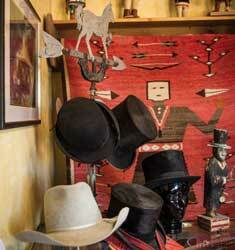 At the Rio Bravo Trading Company in Santa Fe, lucky buyers can find an assortment of vintage hats. 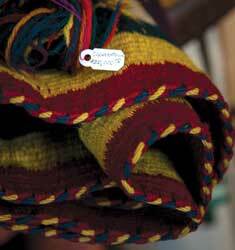 A $20,000 Navajo blanket woven with Germantown, Pennsylvania, wool between 1890 and 1910. The previous owner traded him the shop to settle a debt incurred well after the Santa Clara pottery bonanza put an end to his woodcutting days. Rodriguez figured he’d fill the joint with his latest finds, sell them off, and walk away. That was 30 years ago. Joined in cowboy romance to Donis Quin, he heads to rural burgs all across the Southwest, hangs out at rodeos, where he both buys and sells, and strikes up “whaddya know” conversations in local diners. To his buyers, Rodriguez recommends learning the language of “billanese,” as in cash. The hat customer does just that (after trotting across the street to an ATM). Rodriguez tucks the crisp bills into his pocket, ready for the road. on the Las Vegas town square. he carries a 1920s Ingraham Cordova mantel clock, a steal at $60. The original Our Lady of Sorrows Church on the plaza had lived a deconsecrated life as an auto-parts store, boardinghouse, and dilapidated relic. Kingsbury snapped it up. That was 1996. After converting the second story into loft-like living quarters, he filled the ground floor with eight U-Hauls worth of his Minnesota loot. Plaza Antiques thrives today. Miniature metal soldiers and cowboys fill one case, surrounded by rows of kitchenware, furniture, aged tins, vintage clothes, old New Mexico Magazines, and a private stash of sock monkeys. When I visit, he and his partner, Melissa Greene, have just returned from sating their road lust on a trip through eastern New Mexico, Texas, and Kansas. Two upstairs rooms hold their pickings, including 25 porcelain doll heads, prints of Barcelona bullfights, old cameras, and lots, lots more. With that, he takes a call from Allan Affeldt, owner of the Plaza Hotel, next door. Against all odds, someone has walked in with the original 1882 hotel ledger, and Affeldt needs an expert eye. Kingsbury inspects it and declares it authentic, but shrugs about a possible price. her go-to source for conjuring a rugged hunting vibe. Carla Curry sought a path out of the retail business when she took a then-boyfriend’s advice to apply for a gig on a film crew he was working with. 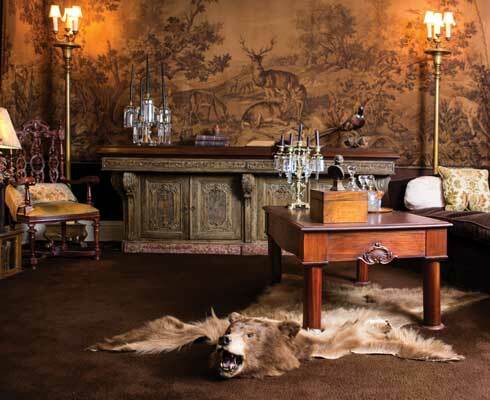 With that entry-level foot in the door, the Hobbs native evolved into one of the hottest set decorators working today. Outfitting movies like Walk the Line, Crazy Heart, and A Million Ways to Die in the West, and TV shows including In Plain Sight, Dig, and Friday Night Lights, she’s crafted a solid-gold network of who has what, where. 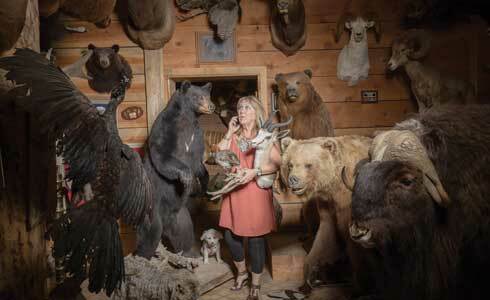 She once stumbled into a veritable taxidermy museum in a San Ysidro feed store, where she and the owner hit it off so well that they watched a Dancing with the Stars finale until the film crew showed up. She’s borrowed the personal desk of Alan Direen, owner of her favorite indoor flea markets in the Duke City. While shopping at an Albuquerque store, she met a guy unloading his mother’s 1980s furniture just when she needed to transform a Northeast Heights home for Gold, a new movie starring Matthew McConaughey. carved credenza, and crystal candelabra. In her restored Roswell home, Ann Wonders melds Southwestern adobe design with a religious statue scored in Boston and a mammoth hunting-dogs painting shipped from England. As the young bride of an aide to an Army general, Ann Wonders fell for a landscape painting in French Morocco. Now in her eighties, she still has it hanging in her Roswell home, where every Spanish table, china cup, and crystal chandelier tells a story. Even the house comes with a tale. You wouldn’t know it today. Bricks salvaged from a nearby dwelling lead to a Prairie-style porch. Past the leaded-glass door, a mahogany staircase sweeps to the second floor. Heavy European furniture mingles with Mexican tin lamps, a well-worn leather sofa, and panes of swirled and pebbled glass pulled from a defunct Roswell movie theater. “I can take any piece of junk and make it look good,” Wonders says. She cut her renovation teeth in New Orleans, where she and her late husband, Doc, lived in the sixties and seventies. There, she salvaged or redecorated 21 buildings. She acquired her final fixer-upper after the couple moved to Roswell to be near her parents. In return for tearing down someone else’s lost cause, she nabbed the weathered wood that now panels the kitchen she and Doc enlarged. They added an adobe-brick family room and sunroom spa, accented by a fireplace large enough to burn a whole tree. Global gleanings turned the teardown into a treasure. 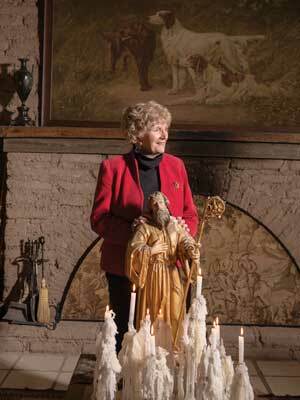 At one point in her decorating career, she owned eight packed storerooms. She’s since cleaned them out, but hasn’t stopped shopping. Wonders knows that in the end, the chairs and tables and books, no matter how precious and quaint, are truly just things—family and friends matter the most. But “I like my things,” she says, adding that things chosen wisely can wield curative powers. —Kate Nelson received the Silver Award in the Writer of the Year category from the International Regional Magazine Association for articles that appeared in the magazine in 2014. At the Rio Bravo Trading Company in Santa Fe, lucky buyers can find folk-art cowboys by the late Santa Fe carver Jessie Gurule for around $500 apiece. In many towns, antiques dealers situate themselves within walking distance of one another. Here are a few notable ones, but keep your eyes peeled for many more. Nob Hill and Los Ranchos hold clusters of shops and indoor flea markets, with others strewn throughout the city. 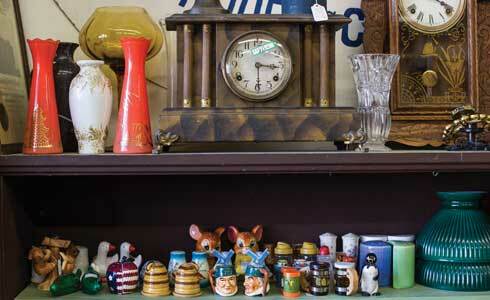 Start at the Antique Co-Op for a wide range of items (7601 Fourth St. NW; 505-898-7354). Form Gallery specializes in midcentury modern furnishings (114 Morningside Dr. NE; 505-934-0969). Antique Specialty Mall on Old Route 66 has something for nearly every taste, including “mantiques” (4516 Central Ave. SE; 505- 268-8080; antiquespecialtymall.com). Things Etc. at the Indoor Flea Market stocks everything from Royal Doulton teacups to rusted metal car parts (11109 Central Ave. NE; 505-268-1717; antiquesandthingsabq.com). Nob Hill’s Morningside Antiques attracts discriminating buyers with fine furniture and authentic décor (4001 Central Ave. NE. ; 505-268-0188; morningsideantiques.com). The Dusty Attic has two stories of antiques and collectibles (111 W. Main St.; 505-327-7696). Regenerated Treasures includes vintage stoves, pinball machines, and claw-foot tubs (915 Farmington Ave., Suite L; 505-327-1131). Ron’s Southwestern Treasures boasts a Spanish Colonial cannon, Navajo rugs, majolica pottery, retablos, and silver jewelry (301 N. Solano Dr., Suite 8; 575-526-7716; ronssouthwesterntreasures.com). 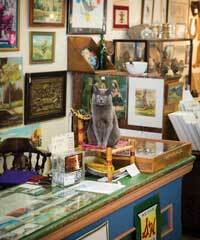 Shop cat Zane Grey (bottom middle) keeps watch at Plaza Antiques in Las Vegas. 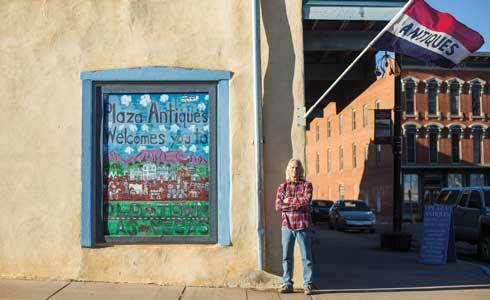 Plaza Antiques offers a potpourri of pickings and great conversation (1805 Old Town Plaza; 505-454-9447). Near the Castañeda Hotel, a former Harvey House, Rough Rider Antiques is a best bet for railroad memorabilia (501 Railroad Ave.; 505-454-8063). Stroll to a handful of shops, including the Roswell Antiques Mall, where you can find farm implements and a vintage cocktail dress (208 N. Main St.; 575-622-4484). Rio Bravo Trading Company scouts the best in cowboys-and-Indians items (411 S. Guadalupe St.; 505-982-0230). Consignment shops abound, including the quirkily fashionable Congeries (1368 Cerrillos Rd. ; 505-989-3445; congeriesconsignment.com) and The Raven Fine Consignments (1225 Cerrillos Rd. ; 505-988-4775; recollectionssantafe.com). Vendors at the 14,000-square-foot Silver City Trading Company carry comic books, furniture, Americana quilts, and Native weavings (205 W. Broadway; 575-388-8989; silvercitytrading.com). Encore has repurposed jewelry and works by local artists (704 N. Bullard St.; 575-644-8859). Ranchos Antiques specializes in Spanish Colonial furniture, architectural pieces, and devotional art from Mexico, Guatemala, South America, and New Mexico (4179 NM 68; 575-751-9323; ranchosantiques.org).